This is a great dessert which my buddies and I learnt from chef Amy Beh who conducted a workshop for us on steaming food. The event was in conjunction with the prize presentation ceremony at the Miele Gallery. 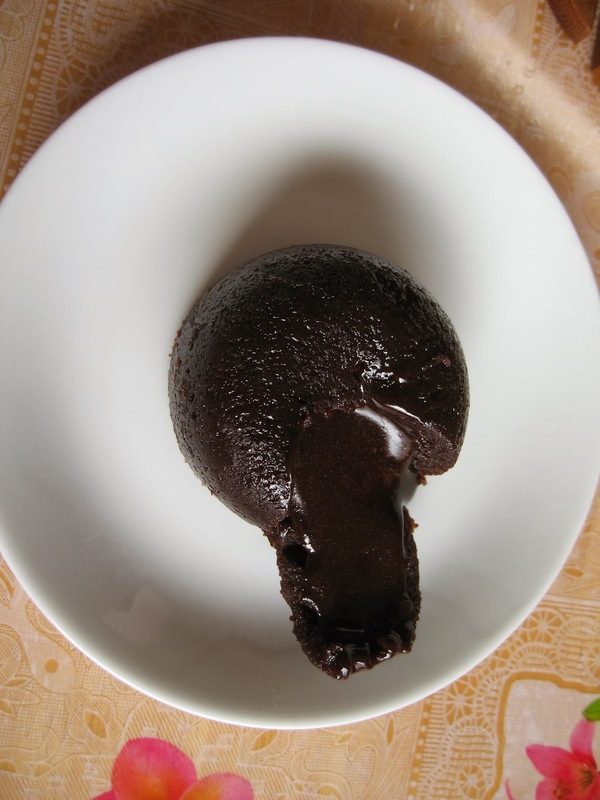 This steamed chocolate lava cake is moist with molten lava oozing out from the center. 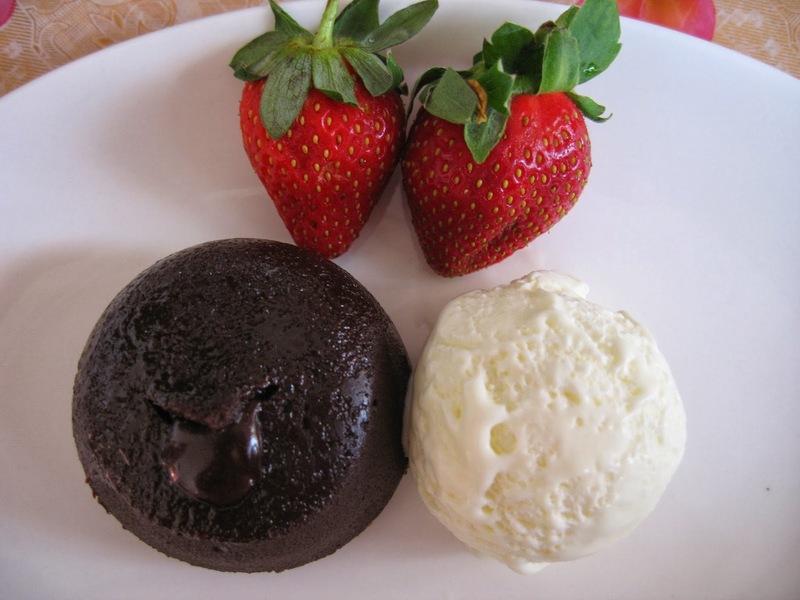 It was great to eat this lava cake with vanilla ice-cream and strawberries. 1. Brush the ramekins or small teacups with soft butter and coat it with castor sugar. 2. Break the chocolate into smaller pieces and combine with butter in a bowl. Cover the bowl with cling film and steam at 90 degree C for 10 minutes in the Miele steam oven. Alternatively, you can melt the chocolate and butter in a double boiler until melted. Allow to cool slightly. 3. In a medium-sized bowl, whisk whole eggs and egg yolks with sugar until well combined. 4. Whisk in flour and salt, followed by melted chocolate and vanilla essence. 5. Pour through a fine mesh strainer to remove lumps. 6. Divide batter into 3 equal portions and pour into 3 ramekins or 3 teacups. 7. Steam in the Miele steam oven at 100 degree C for 9 minutes. 8. When done, check that the cakes are puffed and use a toothpick to insert into the centre to see if it comes out with moist batter attached. Steam for an additional minute or two if necessary. 9. Serve with vanilla ice-cream and fruits/nuts if desired. 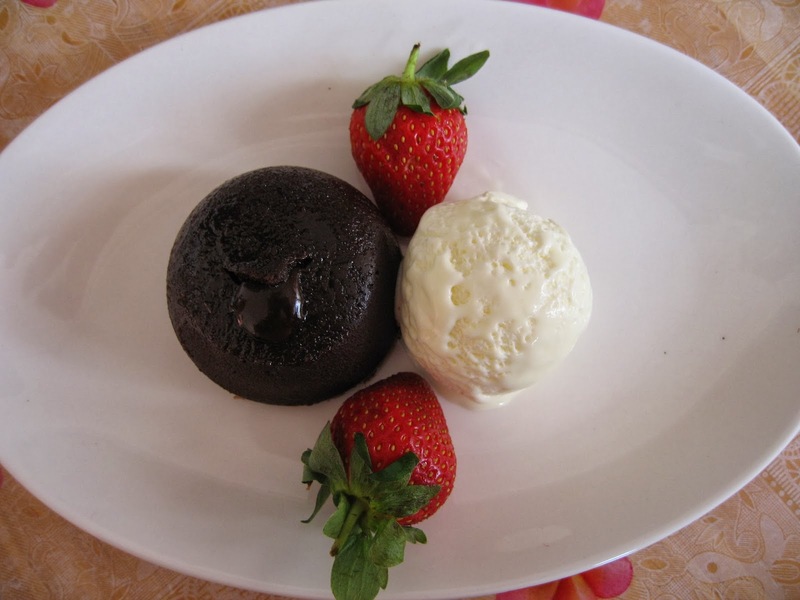 Chocolate lava cake with strawberries and ice-cream. This is one of my favourite dessert, I have made once but unsuccessful! Yours looks so nice! It is not too difficult to make. I am sure you will be able to make it successfully. Hi. I saw your choc lava cake at LTU. 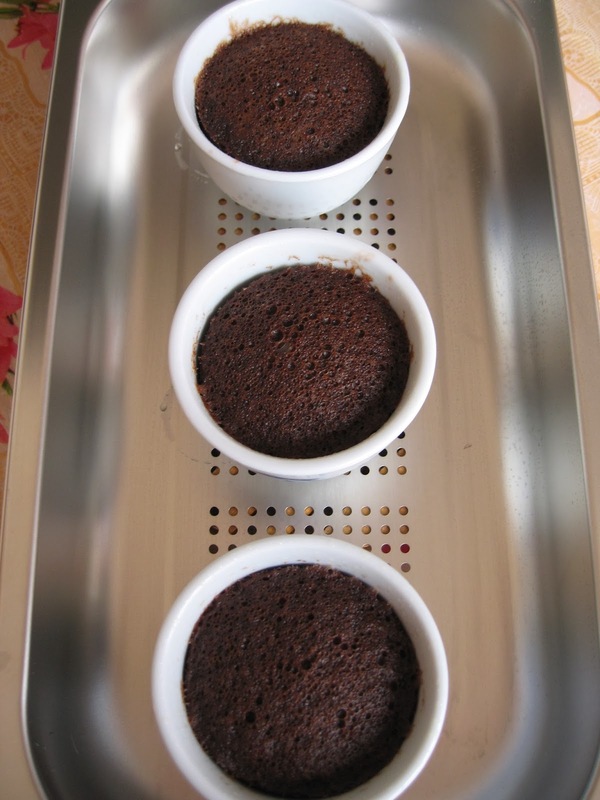 I dont know we can make lava cake through steaming as most of the recipes that i read are using oven. Your's looks nice! Thanks for dropping by. I think steaming the lava cake is easier to do than baking it. Hi.. 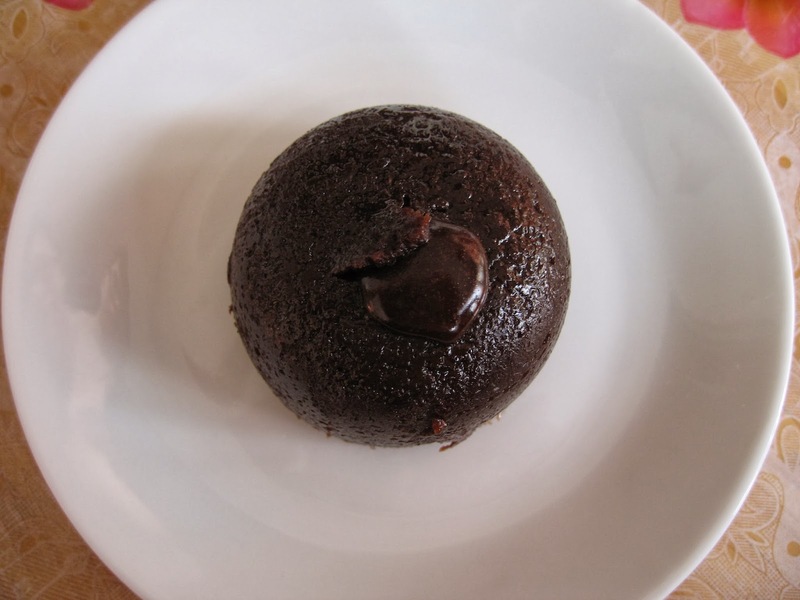 Your lava cake looks mouth watering. I want to try it right away. But I don't see the amount of flour used. How much was it? Hi Linda, Thank you for highlighting this to me. The amount of all-purpose flour used is 22g. 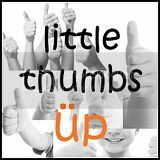 I have updated my blog. Thanks again! I am happy for you at your success. Thanks for visiting. Hi I tried your recipe today and it turned out more like a custard.. Can you guess what might have gone wrong.. I narrow down your problem to excessive water entering your batter during the steaming process. Another thing is you must follow the steps strictly. I hope it turns out fine the next time.